NoNon-centsNanna.com comes from the blogs and writings of Malika Bourne, the No Non-cents Nanna. Nanna provides practical tips and advice for family friendly lifestyle changes based on her own life experience as a mother, a grandmother, and over 30 years of experience as a Registered Nurse (RN). NoNon-centsNanna.com is powered by The Edge of Eternity Networks. Can you trust health care workers to do their job? What happens when you do not trust a health-care-giver who is very nice and get the work done very fast? Only in a perfect world can you trust a stranger. No employee is perfect- not even me. When a family with a disabled person needs extra ordinary care-taking life is stressful enough – then hire a kind acting stranger who seem to have all the necessary skills to help out – but, they are only there for the pay check and all the extras they can rip off. This post will address some issues with health-care employees that willfully cross the line of neglect and fraud, from my per-spective. For the last 6 1/2 years we have had some very good people in and out of our home to care for my adult son who – BAM! – got hit hard with Progressive Multiple Sclerosis. We have also have a number of home health who care-givers who crossed the legal lines. With all of my years of experience as an RN that including doing home-health care, I have let my guard down. It is exhausting living with a disabled person, no matter how much you love them. We family members needs a break on a regular basis, extra outside care-givers are hired by what ever funds we can get to help do daily cares or even the more heavy lifting tasks. Examples: Transferring from bed to wheelchair and back : do Range of Motion and strengthening exercises: bathing; dressing; assist with toileting….and more. Unfortunately we live-in caregivers can not stand over the top of every hired out side employee every minute- it’s CRAZY to assume we can or even should have to. We feel relief when we sleep deprived parents or spouces can grab an extra few minutes of sleep or go out to have lunch with friends because the care-giver is at home doing what they were hired to do…. – all caregivers let their guard down. We are exhausted. There is nothing romantic about caring for an ailing loved one day after day – week after week- year after year. In retrospect I should-a would-a could-a have done things differently when employees proudly proclaimed to be ‘very fast and very good.‘ – According to whom are they very good when they are very fast? RED FLAG! Could “I work FAST” means they may cut too many corners in care-giving? A former caregiver snapped one day when they were reprimanded for not recording* the time it took to do what task. Upon further investigation as the mother of the client being cared for it was discovered that the employee was telling the employer of record that they worked 8 hours a day instead of the actual 1.5 to 2 hours total they may have been in the home. There had been sneaky excuses without making up the not just the time but the health care tasks that were needed to maintain the patients; skin integrity; the joints and muscles to prevent damage as the disease progressed….and more. it was not about being FAST. The prescribed duties to prevent complications were being neglected and act of omission. When is a line crossed that does harm to the patient when he/she consistently is not getting the care that is being paid for? That fine line of neglect and or fraud can be crossed right under the noses of family members of a disabled or elderly patient…one…step…at…a…time…and with charming sweetness…it becomes..easier…and easier… to…get robbed…of…services…your…care-giver…is being…paid…to…do…causing your loved one…or…yourself…to be irreparably..harmed. Who ends up being responsible for a subordinate in the “nursing chain” of task delegation? In our home care-situation with my disabled adult son, we employees do not work under a licence as would happen in a facility. We still have a “pecking order” in our home. My son is the ’employer’ who hires and fires his employees. When an employee in your home is not doing what they should; makes decisions to do something against established protocol; does not communicate in writing or even verbally; leaves early within out doing the job and charges for it – guess who is also responsibly for neglect? overload. The Hot-line for Medicaid fraud takes weeks to get a reply from. Even the Adult Protective Services don’t get out to see the victim for weeks. Sure, call the police who can no nothing because your don;t have an evidence – the offender has the right to be innocent until proven guilty. I do not sanction wrong-doings of any care-giver – in my home or in a facility work place EVER and I try various appropriate ways to correct the other employee I am stuck between a rock and hard place to legally prove there is a problem and how legally handle the problem with out legal black-lash from the employee even if they are dead wrong. Let it go? Forget the Forgive and Forget? Every time a patient: the clients the family members; or manager of a facility or nursing agency Let it Go, for what ever reason, the perpetrator gets bolder and bolder and more sophisticated in crossing the line. These people share with others who will validate their faulty reason for bending the rules or even breaking the law. I think the hardest part of dealing with care-givers who break the law in little steps is to start is convincing the lonely home-bound patient who is capable of making their own decisions – up to this point that the very kind care-giver is doing them an injustice. Strong Statements Must Be Made! We all must stop allowing care-givers to choose to do neglectful acts; stop theft; stopping fraud is way past due. We MUST SPEAK OUT to protect our most vulnerable citizens. Life will turn on a dime making you or a loved one a vulnerable person just ripe for some sociopath to be taken advantage of. But, with so many chains of command especially when the funding like Medicare or Medicaid has to go past so many desks – waiting for a phone call or a written reply – from whom ever covers that area – some one gets SCREWED! There is never one phone to be made that fixes neglect or fraud in the health care setting. Yes, it is a time consuming inconvenience to make legal stink. That is exactly WHY people who have no other skills can get certified as nursing assistants with the sole purpose of de-frauding the weak and vulnerable. When your co-workers are stealing from your employer; sleeping on the job; cutting too many corners with patients and you say NOTHING you are participating in your co-worker’s crimes as an accessory to a crime. if that is the case- SHAME on you! And if you CNA’s do speak up and suffer from it – your life is miserable – I know. You have bills to pay – you don;t want to lose your job for making waves. In the long run because of budget over spends you will not get a raise and you may still get laid off due to loss of accreditation for the department you work in. People who chose to steal from the work place; claim to do the job but don’t become pros at lying and manipulating so much that you can feel like the CRAZY one. They have you chasing your tail feeling like the bad guy. We all suffer for the action of sociopaths. You feel guilty when the make there excuses. ….wait – who agreed to come into work on a certain schedule? The kid’s project is NOT the employers nor a co-workers problem to cover for. Hold the birthday cake! When did you parents suddenly have a birthday? Who agreed to work at a certain time on a certain date? ” My other job called me in to work. gotta go.” …and who has the responsibility to cover your in home patients care that was agreed upon 2 weeks ago? No employee can bill Medicaid for hours they have clocked in at another job for the same time. Yet, this is a SCAM we have seen in the city we lived in too many times….they get by with it by playing on the sympathy of the vulnerable patient who longs for people supposedly cares about them. A bad coworker isn’t just annoying, they can actually be detrimental to your career. His or her behavior can make you feel constantly stressed, which decreases your productivity and can even lead to long-term health problems. This quote is from an article titled: The 3 most common types of terrible coworkers and how to deal with them. This article above is worth reading tho’ not exactly focusing on a care-giver thief or one who bills for work they leave 4 hours early, but is very insightful on dealing with people who don’t do their job for what ever reason they seem to justify. It is easy to say, “Your FIRED!” Donald Trump is so very good at uttering those 2 words. But, firing an employee is more complicated that saying those 2 words. Those rule breaking stinkers end up seeming to have more rights to not be fired than the loss you or a loved one are suffering in the aftermath of being taken advantage of. all too often co-workers know that something is Rotten in Denmark, but do not want to get involved. they say nothing. How will the boss ever know if they do not have eye-witness facts? I am going to address some of these stinking hazards of having employees you really need to get kicked to the curb– they have rights under the law and they know it. As an employer or in my case, the live-in mother- my gut feeling is not concrete evidence of wrong-doing. From my experience when a home caregivers states, “I’m very fast and very good,” I think we family members of the elderly and disabled must proceed with caution about that employee or even a family member…no matter how sweet and helpful an employee seems to be. When the opportunity presents itself – you don’t know who will cross the line of committing a crime under your nose – yes- a CRIME – an your hands may be tied that hampers you from taking appropriate action. Some people may be efficient, but, caring for an aging adult or a disabled person is not a race to be won. Careful attention to detail is a key factor in preventing secondary health issues that ultimately will harm the patient. I have a big gripe about negligence from omission once again by a charming and trusted care-giver in our home. And, I am NOT alone in anguish over omitted health care tasks and fraudulent over-billing when I expected to a loved one was being cared for as instructed. If you have followed No Non-cents Nanna’s blog any length of time you may have read that my ‘full-time job’ has been to care for my once athletic- never been sick adult son who got-BOOM- hit hard with progressive MS. Yes, I do know that you can hire an agency or some family members can get paid to help care for him. Back ground checks are done on employees. But, there will only be a legal record if a person has caught nor reported. all too often the small omissions are not on the record. Traveling with kids is a challenge. Tips to plan ahead when going to grandma’s house for the holidays. 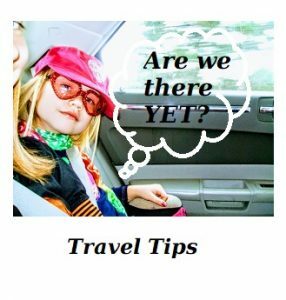 This post will share some of our old fashioned traveling games and some newer ideas from cheap to very nice and neat and more modern… Granny tips for traveling with kids …plus my travel picks from the fun products I just happen to sell in my store. Back in the 1950’s we traveled by car with out seat belts – not horse and buggy- sisters and I knew we had better behave – or else… so we figured out games to play in the car. I still remember dreading long car trips to go to Grandma’s house for the holidays. Back in the 50’s we did not have VCR’s and cozy car seats to ride in, the heater did work too well from where we kids…opening the windows was the A/C. And there weren’t many if any road side rest rooms. Coffee cans with lids -porta potty for when there is no place to “go”. Zipper lock bags – endless possibles for keeping thing clean and organized- and in a pinch- a barf bag that will seal in the smell. Hand wipes- I prefer over hand sanitizer gel – think about it- who wants to smear sticky-icky all over? brown paper bags – bio-degradable containers to collect trash after the packages are open or the banana peels have come off. Re-purpose baby wipe containers – they have a lid that snaps closed and you can stuff little things in and out. Plastic bags – many uses including an emergency cover to prevent hypo-thermia. Write down simple 4 to 5 simple rules of the road. Go potty when you have a chance. Have an emergency CODE word for when every one must listen and follow your directions to stay safe. Mind you there were tons of billboards along the roads that we don’t have have any more that made alphabet games easily entertaining for awhile in the 50 – 70’s. Those billboards helped many a ‘captive audience” to learn to read. A. Alphabet Game – shout out the ABC’s in order when you see the next letter then the next…the big challenge are the J’s. C. Animal, Vegetable or Mineral? F. I’m going on a trip. ..”I’m packing a ____ in my suit case…”. Each person verbally puts something into their suit case. Example: a hair brush. The next persona says, “”I’m packing a ____ in my suit case and in it I am putting a pair of underwear and a hair brush.” The 3rd players add something and repeats everything the other said before…test your memory for so much fun. I. Rhymes with… Pick a word them everyone gets to try to find a word that rhymes with that word… Example: CAR… far, tar, bar, star. jar, mar, scar…. K. How about this novel idea? Talk…just talk.. ask a question then listen. Later on let’s see how many can remember the other people’s answers? M. How many silly Camp Songs do you know? WHAT? You don”t know any? Check out these resources or you may hear your 4 year old sing Miss Poly Had a Dolly 36,987 times before you get to Texas. Please go their website where you will see all kinds of clickable links to words and even videos…sure, It’s OK to cheat with some song videos as long as you Mom and Dad sing-a-long, too…Remember to make your trip a fun memory. Keep this in mind when traveling…MOVE right along…. Children can’t sit still for too long. Their bodies are growing- they must move. Everybody needs to keep moving to avoid secondary complications form not moving. Not only does a behind “go to sleep” but circulation can cut off to major body parts. Old ladies like my self MUST moved body parts are 20 to 30 minutes to avoid getting a blood clot…yes, even younger people can have blood pool in body parts and form a clot. Stop the car every 2 hours- get out walk around- every one should get some air and move. Let the kids take turns being the Exercise Leader. Since I write this old blog and the fact that I do own an E commerce store where I sell fun stuff for kids with an educational twist I want to shamelessly self promote some of the quality items I picked out that meet my persnickety specifications. These 2 are from Melissa & Doug. The list price you see on my catalog pages are what you pay. Heart Felt Play Store covers the UPS shipping fee on all DROP SHIP orders.